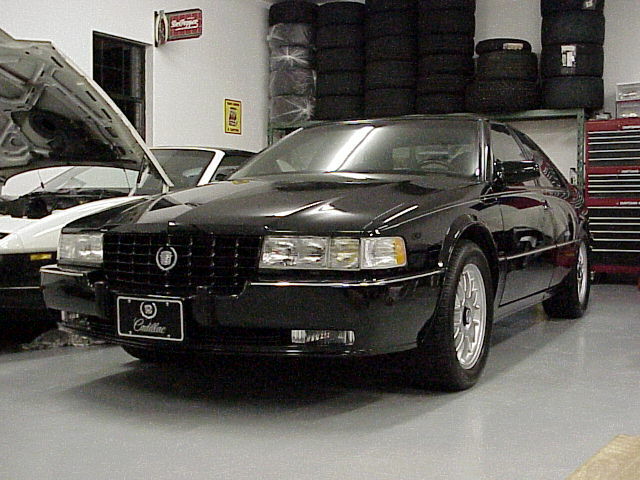 1997 STS Black/Black. This is simply the most perfect condition car I own even over a couple open MSO "0" mile cars I have in my collection. Why is that? Well I bought it darn near new in 1998, and it has been used ever so slightly as just a toy, and has not aged a day in condition or appearance, unlike some of the corvettes that have been plastic bagged since new. Just a better quality car is the main reason for that. 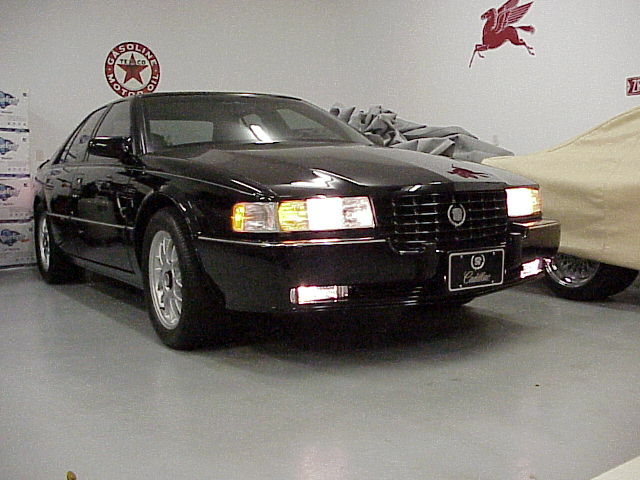 I bought this car because I love Cadillacs and I love the LT5 32V V8 400HP ZR1 Corvette, of which I have owned darn near a dozen and have a few still. Being that this STS has the 32 Valve Northstar 300HP engine, of which its design was taken largely from the LT5 Corvette engine, only made since for me to own one of these. Since I have bought it, the car has covered a bit less than 15,000 miles total. I have had several other Northstar cars over the years that were drivers, this was only a toy. This car has never been in the rain, nor has it ever sat outside a day in its life. 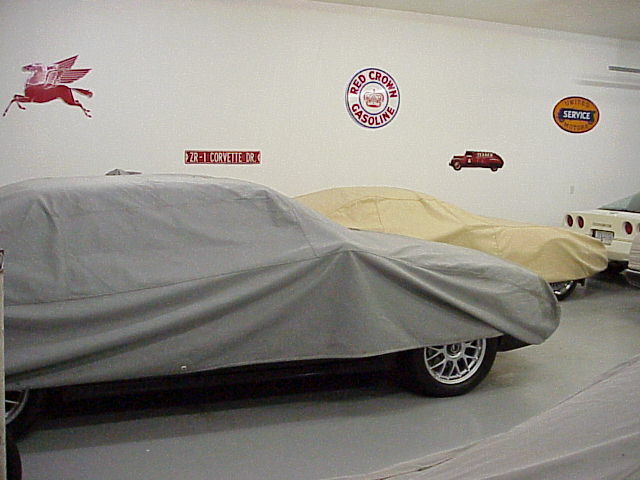 Its home is where you see it in the photos below, In my 12 car garage under a cover, heated and cooled by a Trane 5 ton AC system and dehumidified also as a total collector that (i am told by others) really should not be there due to the poor value and appreciation of these cars. This is the ONLY car I own that I can honesty say that this is truly the nicest example of a particular model on the planet. The corvettes I own have some stiff competition out there, along with the other rare cars I own. This STS simply has no competition as no one kept these cars in the condition I have kept this one. This is not exactly a collectors car and probably never will be either, so to find another car like this is probably not going to ever happen. If you did find an STS of the 93-97 body style, that someone died and left it in their garage with 500 miles on it, it still will not be in the condition of this car. 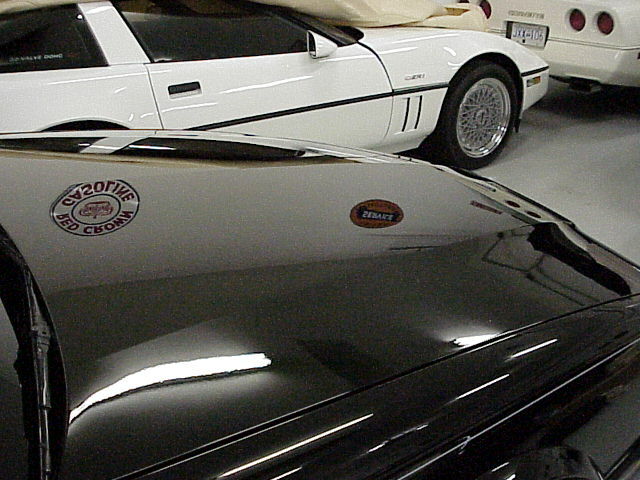 I am certain that car was not waxed every other month and more than likely a door was opened into it, the garage it was kept in got hot/cold damaging the car in ways that only collectors understand, or something happened to that car to take that car away from perfection. This car has not and it is perfect. I would love someone to try and prove me wrong, but even the Cadillac regionals could not do that for 3 years running. This is truly a 100% concourse condition flawless car in every since of the word. I have done some additions to this car that make it one heck of an STS also, and you will not be able to do this to yours no matter how hard you try, unless someone comes out with an aftermarket ECU upgrade, and the likes of that are about "0". First, this is a totally loaded car and also has the EXTREMELY rare factory Z-Rated option, meaning that it will not shut off and does well above 150MPH, bone stock. "check the window sticker below". The Z-rated option included Z-rated tires, a stiffer suspension programming, a different torque converter and 4l80T setup so the car can switch into 4th gear at wide open throttle and lock the converter up under full power, and a bit larger cooling system so you can stand on it. This "z-rated" option was primarily for the handful of European export cars and was not on many STS's in general. 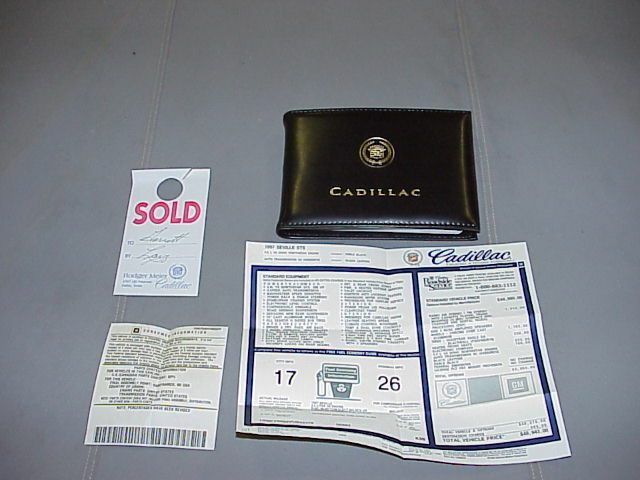 Remember, Cadillac buyers are not performance people by large, and this Z-rated option made the car ride stiffer, so for the Cadillac crowd, it was totally not what they were after making it quite scarce. 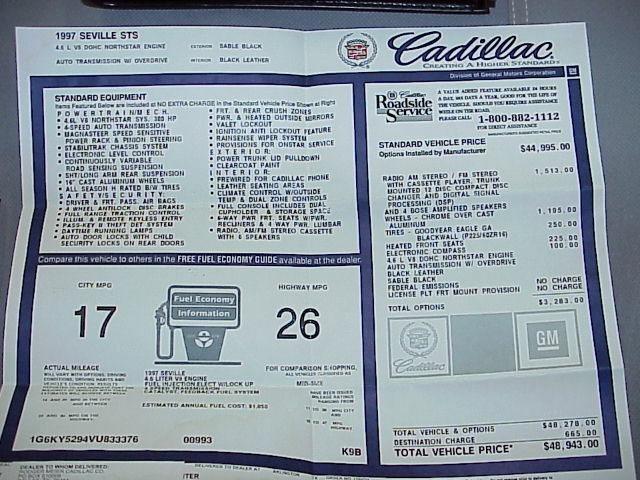 All other STS's are limited to 130MPH and are shut off by the computer that ONLY GM Delphi can program, making it impossible to add this to a non-z rated car. If you try and find a work around for this.. Its a dead end street. You will need a Z-rated ECM from another car to make yours not shut off, and you will probably burn up the transmission if you stand on it as your converter will slip in 4th gear. I had to pull teeth to find a Z rated car myself even though this was a mere $250.00 option... Just rare. To up the performance a bit more over the decent factory performance, I have also had the luck of knowing the service manager of a large dealership that worked with the "1 lap of America" race in 1998, of which the GM Delphi STS took second place. Being a friend, and being current at the time with all the "goings on" with the Northstar, I was able to talk the engineers at Delphi that were "gung ho" about the Northstar and performance, to try out a few of their upgrades on my car. My car ended up with the same programming as the 1 lap of America car from Delphi, and this car has more upgrades than even their car. This is the only OBDII Northstar with a custom ECM software straight from GM Delphi that enhanced performance. I don't care who you know today, you will not get this done as those "performace" guys are all gone over at Delphi, and the Northstar has become a sort of de-tuned engine in the recent years, even though it is still rated the same. Delphi would never do this for anyone due to warranty issues in those days, and today the backbone of software guys on the Northstar are on to other projects leaving the lesser knowledgeable guys to keep their work going. 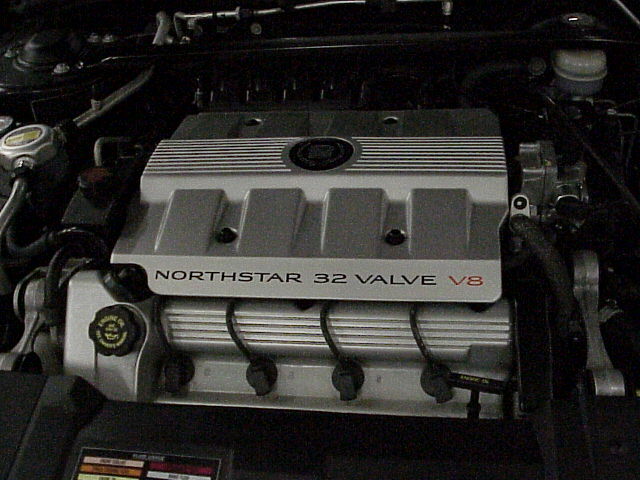 Its just a shame that the aftermarket world never got into software upgrades on the Northstar, as there is some hidden power in the engine.... Just not popular enough though, so it was never done and probably never will be. What these upgrades did was nothing miraculous, but it did stiffen up the already decent Z rated active suspension a bit, added a bit of timing in the low RPMs where the Northstar is actually limited to reduce tire spin, and adjust A/F for a bit more aggressive performance while still retaining all 50 state CARB regulations. All this together give this car a very low 14/ high 13 second 1/4 mile car and a top speed of over 165MPH. This car also has a tuned custom exhaust system that combined with the programming boasts about 335HP. What this means is this car will beat any and all non modified corvettes, less ZR1's/ Callaways or a handful of factory race cars like L88s/ZL1s, from 1953-1995... Yes this also includes the holy grail of money cars, the 1967 435 big block corvette too as they came new. This cars reliability and integrity will also run circles around all the older cars too. This car also has some 17x8 wheel that do amazing things for this cars handling from the grossly undersized tires Cadillac always puts on their vehicles. The tires are 255/50 17 Factory BFG Z rated tires from an Impala SS. 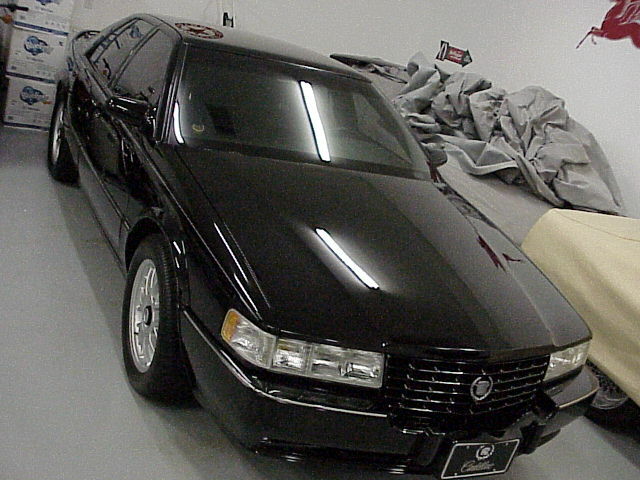 With the small mods this car has and the wheels and tires, it really is a unique car in that respect that handles and performs like very few other Cadillac's on earth (at least of that era until the V series). What I can back up is the fact that this is the nicest condition 1993-1997 Cadillac STS on earth.... No trained judge that sees it in person will ever argue that, and I have got 3 years of doing so already to back it up.